EDM guides are one of the most important parts of a wire-cut EDM machine because they maintain proper wire alignment and ensure the accuracy of the machine tool. Wire-cut EDM machines provide extremely high accuracies of +/- .002” or better and cutting speeds of 20 inches per hour and greater. The cutting action is produced by electrical discharges that are created by EDM wire that is wound on a spool and automatically fed through two guides. 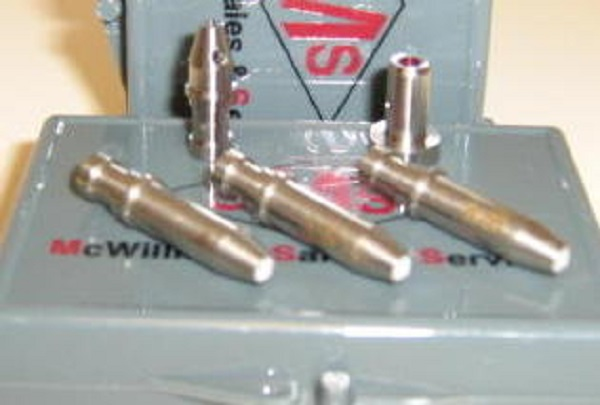 EDM wire guides are located in the upper and lower machine heads. They are CNC controlled and move in the x-y plane for standard cutting or in a z-u-v axis for tapered or more intricate shapes. There can be two types of guides: diamond wire EDM guides and sapphire wire EDM guides. Diamond guides are more expensive than sapphire guides, but also offer higher performance and last significantly longer. EDM guides should be regularly inspected and cleaned to maintain machine speed and accuracy and prevent clogging or misfeeding. This can be done using an ultrasonic cleaner and degreaser, or by soaking the EDM guides in mineral spirits. We offer competitive pricing on OEM guide consumables and sell new, refurbished, and used EDM machines. McWilliams Sales & service also offers in-house equipment service and EDM machine training. Request a quote for EDM wire guides or contact us to learn more about our other products and services. McWilliams Sales & Service supplies numerous varieties of EDM guides and other consumables including colletts, electrodes, filters and more. Request a quote for EDM wire guides today or contact us to learn more about our other products.